Visit www.westerncape.gov.za/jobs and find a job title or area of work that interests you. Make sure you meet all the requirements and that you have enough time to submit your application and supporting documents. 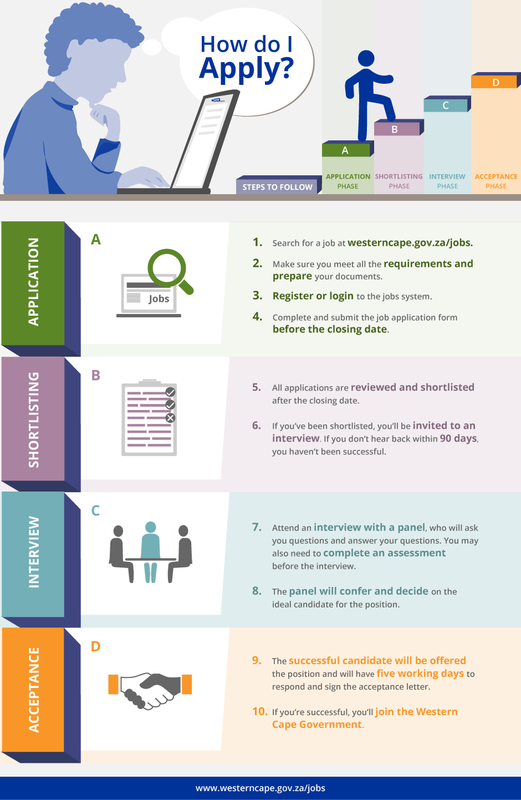 Follow the instructions on the page and a system profile if you're a first-time applicant on the site, or login with your details if you have previously registered. If you're an existing user, update your details and documents where necessary. Complete online job application form and answer all the questions honestly. Once you're satisfied with you application, make sure your CV is updated and then submit it. Western Cape Department of Health: See advert details. We will need the following information when you submit an enquiry: email address used to create your profile, ID number, contact number, desired email address you want to use going forward, and a brief explanation of the issue you're experiencing. Alternatively you can visit one of our Cape Access e-centres or our Contact Centre in Wale Street, Cape Town or the Western Cape Education Department, Grand Central Towers, Cape Town where our helpful staff will assist you. Please note: For enquiries regarding a specific position, please contact the enquiries person as indicated on the advert. Once the closing date has been reached, all qualifying applications will be reviewed and applicants will be shortlisted. If you've been shortlisted, you'll be invited to an interview. You will also be required to complete a Z83 form and supply certified copies of your ID and qualifications, as well as other documentation. At your interview, you'll be greeted by a panel, who will ask you various questions relating to the position, as well as your employment history and personal interests. You will also have the opportunity to ask questions. After all candidates have been interviewed, the panel will confer and decide who the individual best-suited to the position is. The successful candidate will be contacted and offered an acceptance letter or a letter of appointment. The candidate will need to sign and return the acceptance letter within five working days. If you have not received any feedback within three months of the closing date of the job advert, please consider your application unsuccessful.